The Turkwel river basin, Kenya experiences a high level of water scarcity due to its arid climate, high rainfall variability and rapidly growing water demand. Climate change, variability and rapid growth in water demand pose significant challenges to current and future water resources planning and allocation worldwide. 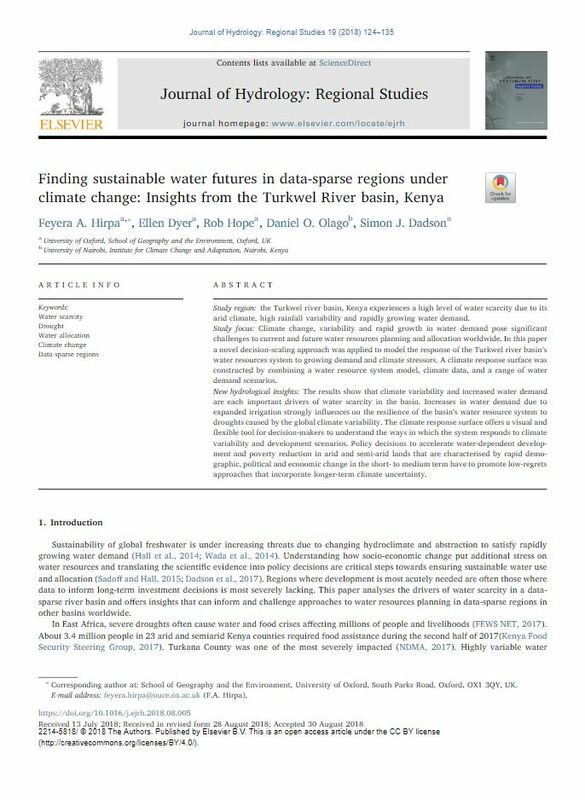 In this paper a novel decision-scaling approach was applied to model the response of the Turkwel river basin’s water resources system to growing demand and climate stressors. A climate response surface was constructed by combining a water resource system model, climate data, and a range of water demand scenarios. The results show that climate variability and increased water demand are each important drivers of water scarcity in the basin. Increases in water demand due to expanded irrigation strongly influences on the resilience of the basin’s water resource system to droughts caused by the global climate variability. The climate response surface offers a visual and flexible tool for decision-makers to understand the ways in which the system responds to climate variability and development scenarios. Policy decisions to accelerate water-dependent development and poverty reduction in arid and semi-arid lands that are characterised by rapid demographic, political and economic change in the short- to medium term have to promote low-regrets approaches that incorporate longer-term climate uncertainty. Click the Download button to access the open access article.